The Skrulls are one of the oldest alien races in Marvel Comics, first appearing in 1962's Fantastic Four #2. The shapeshifting aliens have remained a powerful, and usually hostile, force in the Marvel Universe for decades. Their attempts to conquer Earth never truly ended, and beyond our solar system their wars have raged, most notably with the Kree. 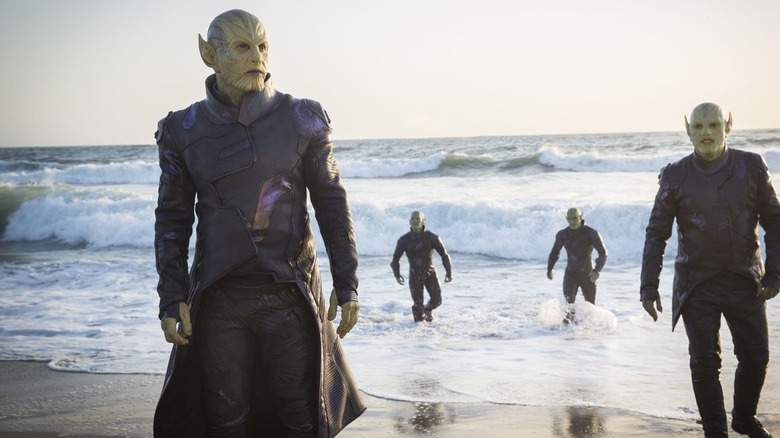 Finally, with Captain Marvel, the Skrulls have arrived in the MCU. Or have they been there all along? The Skrulls were the original "little green men" of the Marvel Universe, personifying every paranoid fantasy about extraterrestrial visitors. They were warlike, they wanted to take over the planet, and most insidiously, they could change their physical appearance in order to infiltrate society and tear it apart from the inside. As years passed and their plots were foiled by the Fantastic Four and their allies, the Skrulls developed new strategies and abilities. Their efforts culminated in the 2008 event Secret Invasion, which revealed the aliens had been hiding among humanity longer than anyone expected. They've since been uneasy allies with Earth's heroes when it benefited them, like in 2013's Infinity, but it would be foolish to think their less friendly intentions for the Earth died with Secret Invasion. For those curious about the green men about to invade the MCU, here's the untold truth of the Skrulls. Marvel Comics fans were likely surprised when watching Guardians of the Galaxy to learn the Kree of that film harbored such a dark and murderous hatred for the people of Xandar. They weren't surprised because they're used to happy and peaceful Kree — they were surprised because as any old-school Marvel fan will tell you, in the comics, the only alien race that can inspire in the Kree the kind of millenia-old fanatical hatred we saw in Ronan isn't the Xandarians. It's the Skrulls. The Kree and the Skrulls are the Hatfields and McCoys — or the Capulets and Montagues, if you want sound like you've got your book-learnin' — of Marvel's comic book spaceways. They hate each other, sometimes each respective race seems to exist primarily to hate the other, and nine times out of ten, if one shows up it's because they're working on a way to wipe out the other. One of Marvel's most ambitious and consequential storylines was The Kree-Skrull War, spanning nine issues of Avengers from 1971 to 1972. The narrative shockwaves of the story are still being felt in Marvel's comics, influencing series and events like Avengers Forever, Civil War, and Secret Invasion. Long before the film arrived in theaters, Marvel Studios President Kevin Feige said the story's influence would be felt in 2019's Captain Marvel. 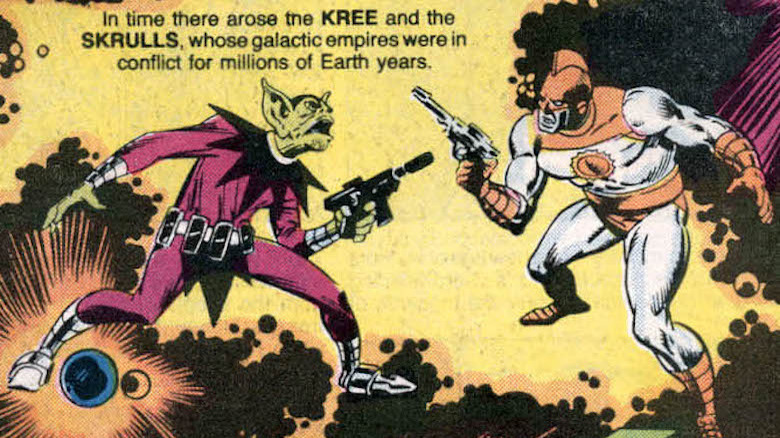 The name The Kree-Skrull War can be misleading. It implies the entire war took place in the pages of Avengers, but it was only a small but important piece of a conflict that's raged for centuries. When Marvel created its Ultimate line of comics — which retold the stories of its classic heroes in updated and Hollywood-friendly ways — there were no Skrulls, at least not at first. The Ultimate comics were the first place the Chitauri were found, and initially it seemed their purpose was to replace the Skrulls. While the Chitauri appeared to be little more than bloodthirsty savages when they showed up in 2012's Avengers, when they appeared in Ultimates – the Ultimate line's answer to Avengers — they were crafty shapeshifters able to make themselves look like any human they wished. An early issue of Ultimates opened with Hawkeye and Black Widow wiping out an entire office building of disguised Chitauri while doing their best impersonation of Neo and Trinity from The Matrix. But the Skrulls wouldn't stay out of the Ultimate line forever. Eventually Reed Richards contacted Skrulls in Ultimate Fantastic Four. 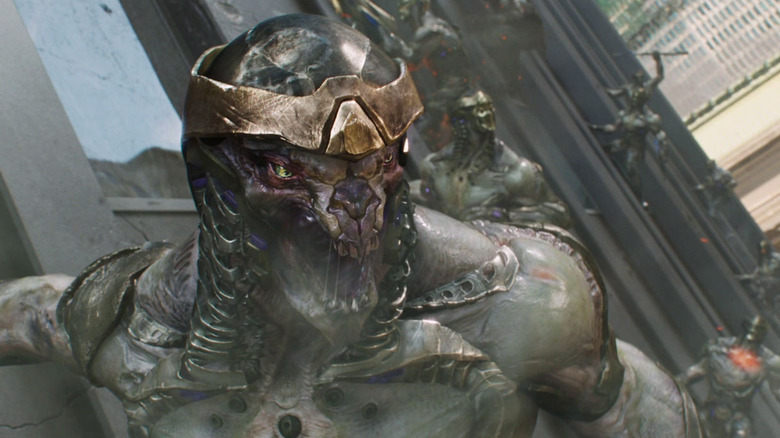 The Ultimate Skrulls knew of the Chitauri and couldn't stand them, precisely because other races were always confusing Skrulls for the younger race (though you'd think a race that specializes in disguising as other species would take it as a positive sign when no one knows who they are). In fact, the Skrull rumors proved so convincing that even one of the actors appearing in the film thought he'd be playing one. Damion Poitier, a.k.a. Duprez of HBO's True Blood, told Geeks WorldWide (via ComicBookMovie) he thought he was going to be playing a Skrull. 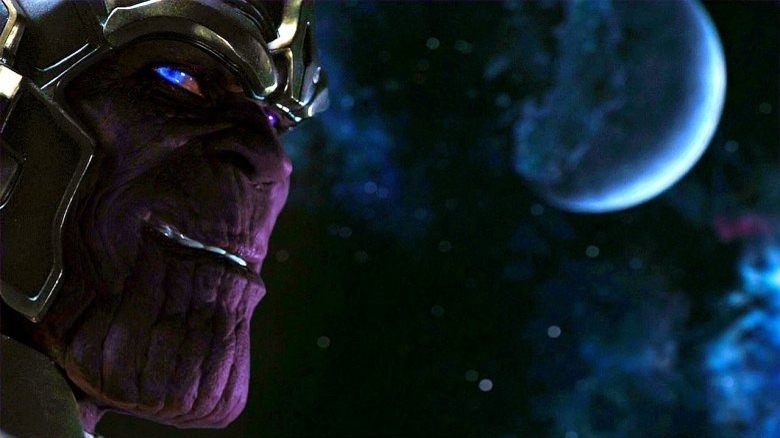 Josh Brolin had yet to be cast as Thanos, so it was Poitier who played the Mad Titan in that brief shot in Avengers' mid-credits scene. Poitier said that — to minimize the chances for spoilers — he wasn't told he was playing Thanos until he was in the makeup chair. "I thought I was going to be the Super Skrull," Poiter said, "because the whole rumor was that the Skrulls were going to be in Avengers." Unfortunately, while the Skrulls are finally making their way into the MCU, it's going to take a while for arguably the most famous and deadliest one of all to show up — Kl'rt, better known as Super-Skrull. The Super-Skrull was an early addition to the Marvel Universe, first appearing in 1963's Fantastic Four #18. Having their plans foiled by the Fantastic Four a year earlier in Fantastic Four #2, the Skrulls reasoned the best way to counter the Earth's heroes was to duplicate superior versions of their powers in one warrior. 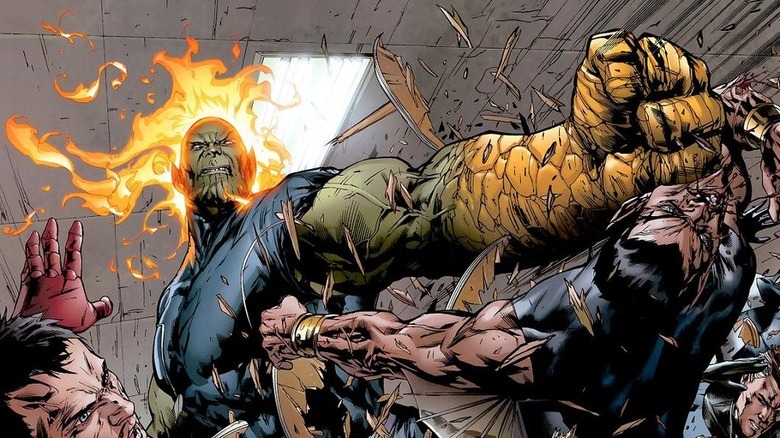 Super-Skrull was given amped-up versions of all the powers of the Fantastic Four — he's stronger than the Thing, hotter than the Human Torch, etc. On top of those powers, he has the shape-shifting abilities of all Skrulls, as well as the extra-creepy power of being able to hypnotize enemies by staring into their eyes. There's a fair chance we'll see Super-Skrull eventually in the MCU. Because of his association with the Fantastic Four, it wasn't even a possibility before Disney's Fox acquisition. But even with Fox's Marvel properties likely to join the MCU, we'll have to at least wait until the MCU Fantastic Four are introduced, and even then it probably will be a movie or two before we see Kl'rt in his full FF-Mashed-Up glory. After all, why would the Skrulls give him those specific powers unless they already knew who the FF were and what they could do? For 2019's Captain Marvel, Ben Mendelsohn signed on to play the Skrull leader Talos, a warrior with one of the more interesting origins of those named Skrulls. Talos first appeared as the disgraced warrior Talos the Tamed in 1994's Incredible Hulk #418. The issue featured the wedding of Hulk's sidekick Rick Jones with his love interest Marlo Chandler, and the wedding — somewhat comically — become a much more crowded affair than anyone expected. A cadre of supervillains appeared to peacefully witness the wedding, as did representatives from various intergalactic empires like those of the Kree and Skrulls. 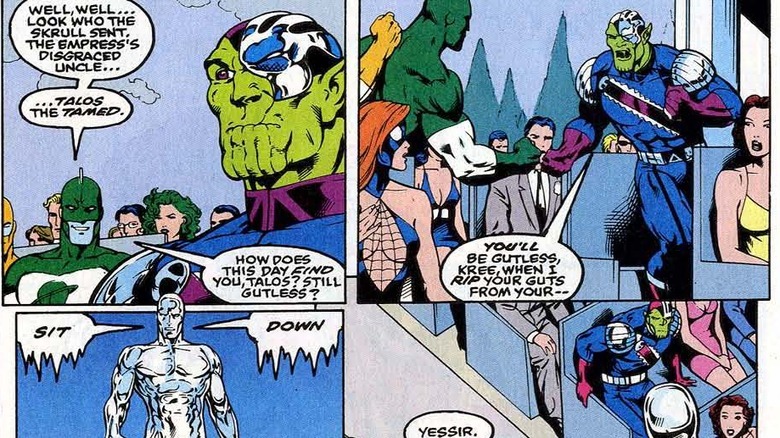 Talos acted as emissary of the Skrulls and before the wedding was finished, the Silver Surfer had to stop Talos and a Kree warrior from bloodying the blessed event. Talos was born without the shapeshifting ability most Skrulls enjoy, but he made up for it with an unmatched savagery and skill at battle. Unfortunately, he was disgraced when the Kree captured him and he failed to commit suicide as Skrull honor demanded. This earned him the title of "Talos the Tamed." The issue after the Jones wedding, Talos attacked the Hulk in hopes that the man-monster would give him an honorable death. Instead, the Hulk stayed his hand and pretended to be humiliated by the Skrull. The battle won back the respect of Talos' soldiers, and he has since enjoyed the title Talos the Untamed. You don't usually find Skrulls on the side of the angels, but one particularly notable exception is Teddy Altman, a.k.a. Hulkling. When Young Avengers launched in 2006, its creative team had a great idea: introduce a team of heroes who appear to be younger versions of the popular Avengers, but make them all brand new characters that no one has ever heard of. There was Iron Lad instead of Iron Man, Patriot instead of Captain America, and in place of the Hulk there was Hulkling — a younger, green-skinned hero who didn't appear quite as strong as the Hulk, but your average Joe probably still wouldn't want to arm-wrestle him. Eventually it was revealed Hulkling's origins had little to do with his namesake. Teddy Altman was the result of a union between the Skrull Princess Anelle and a captive Mar-Vell – the original Captain Marvel of Marvel Comics. 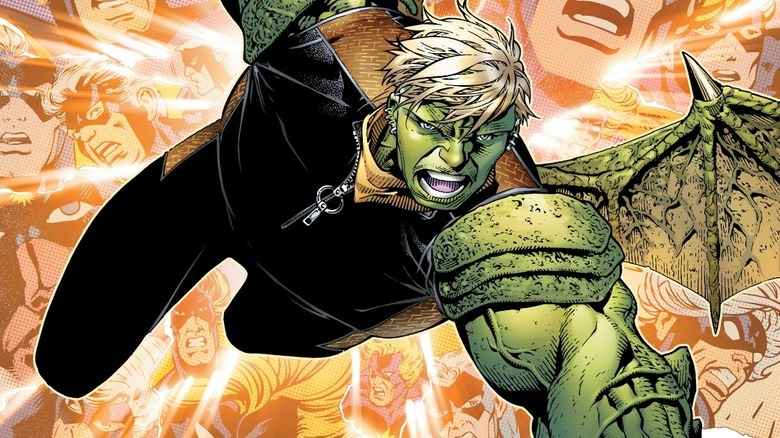 Since his heritage was revealed, Hulkling kept his hero name but stopped using his shape-shifting powers to make him look like the Hulk. Hulkling is also known for being one of Marvel's first openly gay heroes, maintaining a longtime relationship with his fellow Young Avenger Wiccan. To enemies of the Skrull Empire, their most troubling aspect is likely their ability to change shape and disguise themselves as different people, species, animals, or even inanimate objects. Their potential for espionage and subterfuge is terrifying, and nothing proved that more than the 2008 Marvel Comics event Secret Invasion. 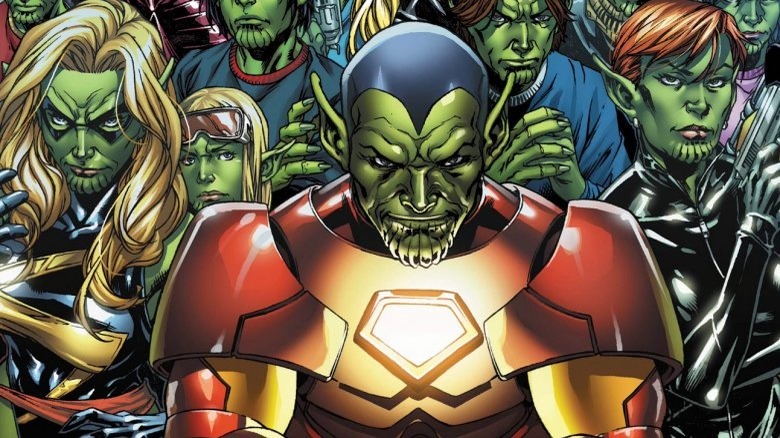 Secret Invasion revealed that ever since the Kree-Skrull War, the Skrulls had been slowly infiltrating Earth — specifically its superhuman population. By the time the invasion became not-so-secret, characters like Elektra, Spider-Woman, and Hank Pym were proven to be Skrulls incognito. With the Skrulls' introduction to the MCU, it's tempting to speculate that the filmmakers will get the same bright ideas as the comic book writers, and we could start learning that some of our favorite heroes and villains have actually been Skrulls for years. It would be a perfect tool for turning back the clock on any past narrative decisions standing in the way of a new story. Hey, maybe it could even explain why Thor: Ragnarok was so much better than the other two. How did Thor loosen up so much in the third one? Oh, he was totally a Skrull. Ever wonder why in Marvel Comics — a narrative that includes (at least) dozens of different species across the cosmos — the only mutants with special powers show up on Earth? 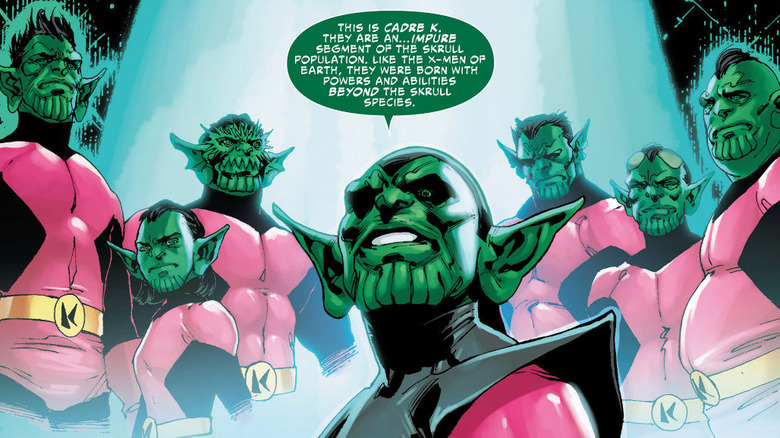 Apparently someone at Marvel wondered that too, and the result was Cadre K.
Cadre K was made up of mutant Skrulls born with abilities and in some cases appearances that set them apart. Skrulls, it turned out, treated mutants even worse than Earthlings did, doing everything they could to identify mutant Skrulls at birth and killing them. They first came into contact with the X-Men when the villain Apocalypse tried to use them in one of his plans. Afterward, Professor X returned to space with the mutant Skrulls so he could train them to effect change in the Skrull Empire. He returned to Earth with the newly named Cadre K during the 2000 line-wide event Maximum Security. Cadre K was last seen at the conclusion of the series A + X in 2014, when the mutant Skrulls had settled on a ranch in South Dakota. Like most super-powerful mutant aliens. Among the various arguments you may hear from vegetarians — or use if you happen to be a vegetarian — it's likely "because you might eat something that was actually an alien and then you'll develop special powers and an inexplicable hatred for the race of aliens you ate" probably isn't at the top of the list. But in the Marvel Comics universe, it would be a pretty valid point. In 1995, writers Grant Morrison and Mark Millar — who would both leave huge marks on the comic book and pop culture landscapes with other series — wrote Skrull Kill Crew about a group of Earthlings who were transformed after unintentionally eating Skrulls disguised as cows. See, when the Fantastic Four first encountered the Skrulls way back in 1962's Fantastic Four #2, the conflict ended when Reed Richards used his technology to convince the Skrulls they were cows. Yes. Cows. In Skrull Kill Crew, it was revealed that many of these Skrull-Cows were slaughtered, butchered, and served as food. Eating the meat killed many people, but others were gifted with Skrull shape-shifting powers as well as intense hatred and fear of Skrulls. The latter were gathered by a man known only as Ryder, who was intent on following his newfound impulses to sniff out and wipe out any Skrulls he could find. 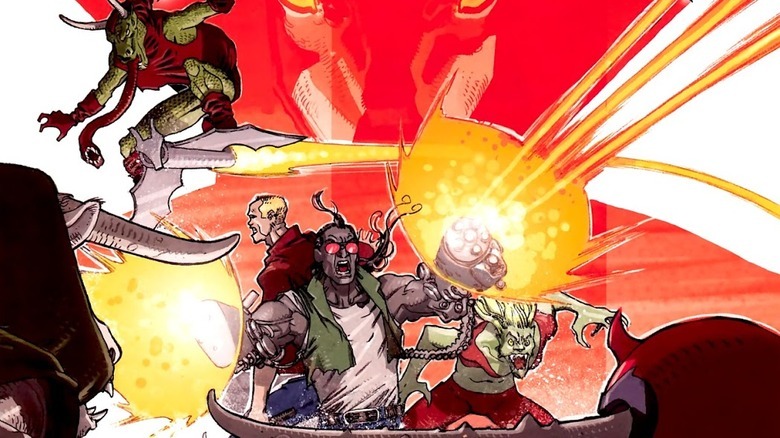 The original series was short-lived, though a Skrull Kill Crew miniseries popped up during Secret Invasion, minus the talents of Morrison and Millar.